This name uses Spanish naming customs: the first or paternal family name is García and the second or maternal family name is Linera. 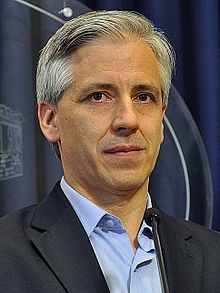 Álvaro Marcelo García Linera (Spanish: [ˈalβaɾo ɣaɾˈsi.a li'neɾa]; born 19 October 1962), is a Bolivian politician who has been Vice President of Bolivia since 2006. García wrote a monograph about the different political and social organizations that were a part of the political rise of the MAS and other indigenous factions, Sociología de los Movimientos Sociales en Bolivia (Sociology of Social Movements in Bolivia), which was published in 2005. García was elected vice president as the running partner to Evo Morales in the 2005 presidential elections. He is an advocate of nationalization of Bolivia's hydrocarbon industry. In 2005 interview, he said that hydrocarbons "would be the second unifying factor of this society in October, 2003" and that "the debates over hydrocarbons are playing with the destiny of Bolivia." In December 2010, Linera posted the cables mentioning Bolivia from the website WikiLeaks, which leaks information from classified sources and whistleblowers, on his official page. Linera said linking this negative information was intended to allow people to see “barbarities and insults” in Washington and to expose their "interventionist infiltration." García Linera has defended the Law of the Rights of Mother Earth, saying that it is not intended as a means to hamper industrial development or mineral extraction. Private miners have disagreed with this stance, suggesting that the law allows the government to expropriate their operations without providing compensation and that is signals Bolivia is hostile to foreign investment. García Linera has indicated his intention of leaving politics for teaching and writing in 2014, at the end of his current term. He did not comment on his re-election the same year to the present day. On March 8, 2012, García Linera publicly confirmed his engagement to Claudia Fernández Valdivia, a news anchor with Bolivian television station Red Uno. They were married in September 2012, holding an indigenous ceremony on Saturday the 8th and a Catholic one on Sunday the 9th. In the early 1990s, García Linera was the leader of the Túpac Katari Guerrilla Army. In 1992, he was accused of armed uprising and arrested along with several other insurgents. He was freed in 1997. ^ Garcia Linera, Alvaro. Sociología de los Movimientos Sociales en Bolivia. La Paz: Plural, 2005. ^ Webber, Jeffery R. (25 April 2005). "Marxism and Indigenism in Bolivia: A Dialectic of Dialogue and Conflict". ZCommunications. Retrieved 3 December 2012. ^ "Bolivian VP Posts WikiLeaks Cables on his Website". Fox News Latino. 8 December 2010. Retrieved 21 November 2012. ^ "Documentos revelados por Wikileaks ratifican un gobierno imperial, intervencionista y abusivo: García Linera". FM Bolivia. 30 November 2010. Retrieved 21 November 2012. ^ Achtenberg, Emily. "Earth First?". Knowledge Beyond Borders. NACLA. Retrieved 20 November 2012. This page was last edited on 2 October 2018, at 19:05 (UTC).